Emprum's UltiMate GPS, looking fairly ordinary, as far as tech gadgets go. - What is the impact of supporting a humanitarian cause on a small business? - What was the response from customers? - What is the business impact of bypassing the lowest-cost labor? - Are there synergies between humanitarian causes and HiFi? I had a unique opportunity to get to know Roger Koumans, the CEO of Emprum, Inc., an American-based company that manufactures a small, but very useful GPS dongle for iPhones, iPads, and iPods, the UliMate GPS. The product was hugely popular at launch due to its ability to augment the internal GPS capabilities of iOS devices and also because it was technologically a step ahead of the competition. While the product is now a few years old, it still maintains a strong cult following in its niche market segment (runners, sailors, cross-country bikers, ATV enthusiasts, pilots, etc.). I’m not much of an outdoorsman, so highly-accurate GPS devices aren’t exactly on my radar. However, what intrigued me about the product was that the side of the packaging prominently championed a social-humanitarian cause called Falun Gong. Now, in business, it is very rare for a company to take any social, humanitarian or political position. The fear is that this will scare some customers away, distract from the product, and generally be considered bad practice. For Emprum, however, this wasn’t the case. As a matter of fact, it’s quite possible that not only did it increase sales, but more specifically, there occurred a synergy between the product and the message that had a positive impact on reaching new customers. Mr. Koumans is a practitioner of Falun Gong, also known as Falun Dafa, a spiritual and social movement that originated in China but is now outlawed there. At its height, Falun Gong had over 70 million practitioners. The Wikipedia definition defines Falun Gong as “a Chinese spiritual discipline that combines meditation and qigong exercises with a moral philosophy centered on the tenets of Truthfulness, Compassion, and Forbearance.” While most Western countries are fairly open to religious freedoms, China’s government viewed the popularity and fast growth of Falun Gong as a threat and has been suppressing it harshly since the mid-1990s. By July 1999, Falun Gong was officially outlawed, and according to human rights groups, “Falun Gong practitioners in China are subject to a wide range of human rights abuses; hundreds of thousands are estimated to have been imprisoned extra-judicially, and practitioners in detention are subject to forced labor, psychiatric abuse, torture, and other coercive methods of thought reform.” While reports such as these regarding oppression in Communist countries are not unheard of in the West, the "Epoch Times published a number of articles alleging that China was conducting widespread and systematic organ harvesting of living Falun Gong practitioners” (Wikipedia). This is very disturbing, and makes the idea of mentioning a humanitarian cause on a product even more surprising. It would be a gamble for any small company with a very small niche market to do this. Imagine if Steve Jobs, Steve Wozniak, and Ronald Wayne had plastered “Down with Pinochet” on the side of their Apple 1 computer boxes when they started out in 1977. Or what if Ben Carter, Bob Hertig, and Peter Maltzan, who founded U-Turn Audio through KickStarter, added a section on their website supporting independence forTibet? That would have been quite bold, but this is precisely what Mr. Koumans did. So how did that turn out for this fledgling small business? A close-up of the UltiMate GPS device, clearly showing the company logo. Q. Mr. Koumans, what was your reasoning for placing a notice about Falun Gong on the side of your packaging and on your web site? A. I was first superficially introduced to Falun Gong sometime late 2000. I seriously picked up the practice around April 2002 while working as an engineer at a fiber laser company in Pasadena, CA. Having personally experienced the positive impact the practice had on my health and life, I became very intrigued by the practice and researched it and its history and origins in great depths. This of course brought to the surface Falun Gong’s great popularity in China during the 1990s as well as the cruel hate and persecution campaign that was started on July 20, 1999 by Jiang Zemin, then president of the Chinese communist party. I believe it is the duty of any human being to speak out when he sees a fellow human being in distress or in need of help. Of course there are many humanitarian causes in the world that need attention, but the persecution of Falun Gong hit real close to home having witnessed aspects of the persecution personally here in the US through the heavy hands of Chinese consulates, and furthermore, knowing that the persecution affects 70-100 million practitioners and their families in China alone, I believe this is a large scale, horrific and organized persecution against a group of innocent people, and that it needs immediate and global attention. Although confirmed death cases run in the thousands, the unofficial number is likely in the millions. My business website, the product packaging and the UltiMate GPS App provide a great communication channel for people worldwide to raise awareness about this persecution. The humanitarian statement is also found under the "Who We Are" section of the website. Notice that the unique and symbolic design is the same as the company logo. While the Humanitarian message is not repeated on the actual UltiMate GPS device, it does perhaps serve as a small reminder of the greater cause. Q. The notice on the packaging is still rather toned-down, although I understand that you are very passionate about the cause. Certainly the horrible experiences that have been alleged about the treatment of Falun Gong practitioners weighs on your mind. Why or why not mention more specific details about this? A. Of course you have to strike a balance when you go about things. Your customers are looking for a product and you can assume in general, that is the only reason they are visiting your website, downloading your app, or checking out your product retail box. You also only have a limited time span to catch their attention. So your message should be short and to the point. If your message does catch their attention though, they can make their own choice to further inform themselves by following the relevant links in the message with more details about the persecution against Falun Gong (see: www.faluninfo.net). On the Emprum website, we have a brief section with our humanitarian cause under the “Who We Are” page. On the side of the product’s packaging, we have a beautiful image with some text and a website link and the product’s box insert also contains similar information. In our App Store app we have a screen about our humanitarian cause under the “Preferences” tab of the app. For all the products that are ordered directly from our website, we do insert a flyer with more details about the persecution when the order is shipped. This is the caption on the side of the packaging - nothing too obtrusive or controversial, it's actually very tastefully done. Q. The Epoch Times alleges that Falun Gong practitioners outside of China are also pressured, intimidated, and in some cases attacked. Do you believe that this may have scared customers away from your products or has this strengthened resolve to purchase them? A. Indeed, I have personally experienced the persecution here in the US. One of my friends had both front tires of his car slashed while doing a peaceful protest in front of the Chinese Consulate in LA. Local Falun Gong groups have been directly or indirectly intimidated by Chinese Consulate officials when trying to participate in local public parades and events. So yes, the persecution extends worldwide and beyond China. I think in general, Westerns are not that easily intimidated. However, the majority of the Chinese, and that includes the Chinese that are permanently in the US as well as Chinese tourists that visit here, are still under the tight grip of the Chinese communist party and its culture. Most of them do not wish to touch upon the topic of Falun Gong and if you mention it to them or try to hand them a flyer, they will quickly walk away and refuse to talk to you out of fear that some Chinese plain-clothes policemen or consulate official is watching them. With respect to the message on the product, I don’t think it scares away someone brought up in the Western world, but it might scare someone with roots in Mainland China. However, the message on the box has served its purpose in that case: even though the person might have been scared by the message and not have purchased the product, he had read the message and that is the whole purpose of placing the message there in the first place. When I decided to raise awareness about the persecution against Falun Gong through my business, I made a promise to myself to never waiver in this endeavor, even if I might lose some sales over it or if someone would try to convince me it would be better for business not to put the message there. I think in Western culture it could even be likely that a customer will pick a product with a cause over one that doesn’t have one. Q. Have your customers responded about the Falun Gong notice and your beliefs? If so, what did they say? A very small number of people will actually object to you providing them with this kind of information saying that they rather not be confronted with these kinds of things. Over all these years, I have only received two emails where the customer appeared offended. One of these customers was from Israel, so I explained the situation to him from the standpoint of the many millions of Jews that were killed during World War II and that maybe if more people would have been aware earlier on and had spoken up when the first rumors about concentration camps came out, maybe not as many Jews would have been killed. This customer then send me an email back apologizing for his first email and stating that he now fully understood where I was coming from. I responded in a similar way to the second customer who was offended, but did not get a response back from him. He might as well have understood where I was coming from after having explained the situation in more detail to him over email. Q. These days, just about anything electronic is made or sourced in mainland China. How did you manage to ensure that none of the parts in your products are made there? Likewise, mainland Chinese manufacturing is often the most economical. How did you manage to keep expenses down? 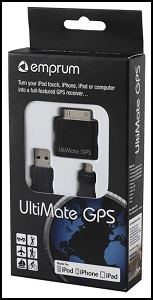 With respect to the UltiMate GPS, the product is assembled and manufactured here in California. We use a local manufacturer in Orange County. Of course, some parts of the product come from elsewhere as you can’t get everything here in the US, but I made a point of avoiding mainland China completely as I did not want to sponsor a country that abuses its own people to such an extent. It is really not that difficult to produce a quality product here in the US at a reasonable cost. I obtained assembly cost quotes from both Taiwan and US based manufacturers; assembling the product locally was only a few dollars more expensive per unit than having it done in Taiwan. Doing it here was pretty much a no brainer considering the additional overhead, travel, language barrier and additional shipping it would have cost were the product produced in Taiwan. Another interesting thing to mention here is that although Taiwan is a completely autonomous democratic country and separate from mainland China, the persecution of Falun Gong and the indoctrination by fear by communist China extend there as well. The product box and insert is printed in Taiwan (I couldn’t find the 3D printing style anywhere here in the US). The product box manufacturer suggested to me a number of times that it would be safer to remove the Falun Gong related message from the box as the boxes would be shipped through a hub in China and the manufacturer was afraid that if the shipment would go through customs and would be opened that Chinese customs would confiscate them because of the message. But also in this case, as explained earlier, I didn’t waiver. It was difficult to explain my thinking to them, but in the end I stuck with what I set out to do. Q. From what I gather, you are strongly anti-Communist and someone who champions freedom of faith, choice, and political opinion, is that accurate? I am against anything and anyone that suppresses people’s fundamental freedoms, like freedom of speech, freedom of religion, freedom of press, freedom to assemble, etc. To me, it doesn’t matter in what political or non-political environment that suppression takes place. Any such suppression is bad. Of course such suppression is more likely to occur in communist countries or under dictatorships. Let me also clarify one more thing here. When the Chinese communist government sees its actions being criticized, it always tries to make a political case out of it and it indoctrinates people to think in that same way. However, Falun Gong practitioners are not against China or the government; Falun Gong practitioners have no political objective; we are not interested in any political power, nor is it their intention to overthrow the Chinese communist party. This is a case of human rights abuses. What we are against are the crimes committed by the Chinese government against Falun Gong practitioners. One of the crimes that needs immediate attention is the harvesting of organs from Falun Gong practitioners and selling them for profit (see: www.stoporganharvesting.org). The top view of the UltiMate GPS device - looking ordinary. Q. Your customers are typically outdoors enthusiasts. Do you believe that an anti-Communist and freedom-of-faith message resonates with them? I think that in general a message that speaks out for a suppressed group of people, for human rights, for various freedoms, etc. will resonate with most people. Some people will care and be active about it, other people will care but prefer not to get involved, and some people won’t care at all, no matter what you tell them. We are all different, but I think that each of us does have that little bit of humanity left in his heart which is what keeps us going despite all the hardships that we endure. Q. Do you believe this synergy was good for business? I believe that doing something good will be rewarded with something good and that doing bad things will be reciprocated with bad. Or, as there is the Western saying: what goes around, comes around. I think it is important to do the right thing in business and not only base business decisions on how much profit can be made or how business relations might be affected. I try and run my business in an upright and righteous way and that may not always be as easy as it seems, even in this simple case of putting a humanitarian message on a product box. I think overall, considering the environment, thinking of fellow human beings, etc. is a good thing for your business. You will be rewarded for it one way or another. It might just come in a way that you don’t expect. Q. The GreenHiFi website focuses on synergies as well – the idea that Hi Fi and environmentally-conscious practices have much in common. I would even go so far as to say that finding synergies is a key component of business success, in light of a better and faster-informed customer-base. Would you agree with that assessment? Traditional business that doesn’t focus on synergies can be successful, but in this day and age, things like the environment, impact on people, human rights etc. are becoming more and more mainstream so I think that for a business this is something not to be overlooked in the future. Of course small businesses are more agile and can adapt much faster to trends, so informing customers and suppliers early of social objectives is of course a great thing. In the future, more and more people will care about such things, instead of just about where one can get what s/he wants at the lowest price. I believe building that closer relationship with the customer will become norm of the future. Q. HiFi is a niche but competitive market. Smaller companies sometimes struggle just to start up and then also to stay in business. Do you have any other recommendations from your experience that you would be willing to share? This was a difficult article to write. In blogging, just as on social media sites, one is quickly reminded not to take a strong political position on anything. If a post or comment mentions a cause, the negative responses quickly force us to backtrack or apologize for offending someone, anyone, really. This is actually a form of community-imposed censorship that is much more pervasive than we may realize. In HiFi, mentioning Falun Gong, a group that is oppressed by the government of the largest producer of electronic goods in the world, is bound to bring GreenHiFi some grief as well. That said, talking about community-censorship is an important topic for our time. I truly believe that this is a green issue not just because we are discussing the oppression of a group of people, but also because we are talking about speaking out for what we believe to be right and the consequences therein. I also believe that this topic resonates with a younger generation who does care about this issue. I hope this generation will be energized by Mr. Koumans' courage. I hope that it generates discussion about this issue not just in their own blogs and social media pages, but more importantly, also in every aspect of their lives. This younger generation is also tomorrow's consumer and they can vote with their dollars to buy products that share their beliefs. Perhaps some of these young professionals will one day also start their own companies and champion causes dear to their own hearts on the packaging of their own products. Perhaps it's about time we see an Amnesty International candle on cereal boxes, add a pink triangle on the bottom of YouTube videos, hear a #1 pop song about famine in sub-Saharan Africa, or see the nest episode of Downtown Abbey commercial-free because it is sponsored by a Solar Energy company. Whatever one's view is about Falun Gong, most of us do believe in the basic freedom to discuss and defend one's beliefs. That is something that Falun Gong practitioners are also passionate about and that is also something Green HiFi is passionate about.